No blog posts for a while. Out almost every night knocking on doors and delivering leaflets with little time for niceties. Good to see an attack on us by the Lib Dems in Fant. This bodes well and suggests that they see us as a threat, which we clearly are given the catastrophic collapse in support for them. The real trouble is that we get tarred with their brushes ("you are all the same"). Of course we are not, but if the ability of Lib Dems (and Labs) to say one thing and do something else is shamefully staggering. I gather that Labour are targetting Fant. 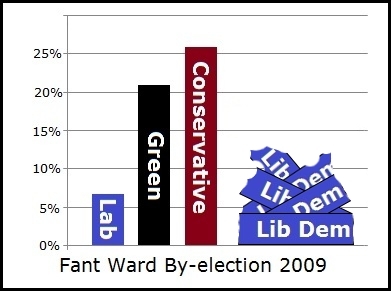 They have come last in most of the recent local elections (7% in both of the 2009 elections). They are wasting their time. Only the Greens can beat the Tories in Fant... 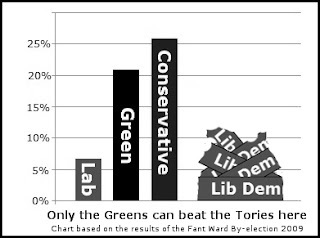 I gather that the Lib Dems hit the roof when they saw the bar chart on my leaflet.